In bankruptcy law, "termination" is synonymous with "dismissal." The termination of a case means the court closes it, sends out notices to everyone involved, and no longer will consider motions or other litigation on the part of debtor or creditors. The debtor's financial and legal status returns to the "status quo ante"; that is, to the same state it was in before the bankruptcy was filed. If the debtor has filed for Chapter 13 bankruptcy, a court dismissing the case also cancels the repayment schedule. Even if the bankruptcy trustee has already made partial payments to creditors, the full debt owed before the filing again becomes current and payable to the creditor (minus any repayments). This most often happens when the debtor is unable to meet the minimum monthly payments set by the trustee. 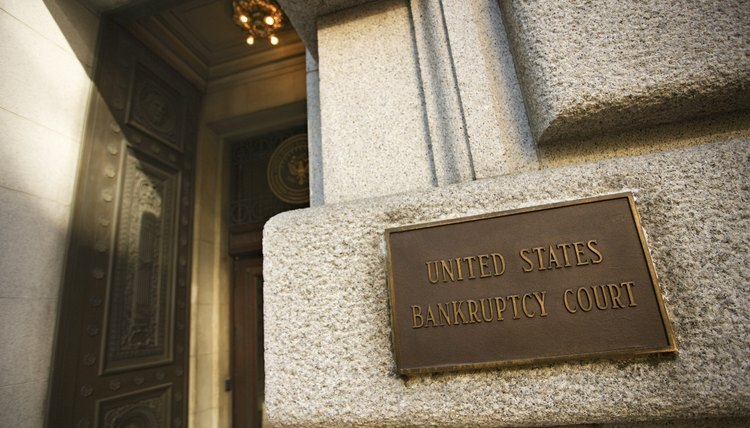 Dismissal of a Chapter 13 case often allows the option of converting it into a Chapter 7 bankruptcy, which discharges (cancels) all dischargeable debts. A debtor can file a motion to terminate an open bankruptcy case. This motion would ask the court to dismiss the bankruptcy, cancel any hearings, and allow creditors to seize secured property or start collecting the debts. This might be done if the debtor's financial situation has improved and the debtor wants to repay the dischargeable debts. Termination does not, however, erase the bankruptcy, which is reported to the credit bureaus as soon as the case opens with the initial petition. Dismissal or discharge of a bankruptcy is not reported to the credit bureaus — only the initial filing, which stays on a credit report for 10 years, at a minimum. The bankruptcy court may also terminate a case by finding misconduct by the debtor. This may include the debtor placing false or fraudulent information on the bankruptcy petition; hiding assets to protect them from seizure; placing property in someone else's name for the same purpose; failing to attend a hearing or file a required document; or filing a frivolous petition for the purpose of delaying repayment of a debt. Termination "with prejudice" means the case may never be reopened; in some cases, a court will dismiss without prejudice and allow a debtor to rectify the situation and reopen the case. "Termination" may also be used to mean "discharge," but there is a major difference between dismissal and discharge. A bankruptcy discharge is the issuance of a permanent order by the bankruptcy court that a debt is cancelled. Effectively, the debtor is relieved from the debt as well as any collection action by the creditor. Some debts can't be discharged, including federal taxes, child support, and federally guaranteed student loans. In a Chapter 13 bankruptcy, discharge means the debtor has satisfied the repayment schedule. In a Chapter 7 bankruptcy, it means the court has completed the bankruptcy procedure and dischargeable debts are no longer valid. After a case is dismissed or discharged, the law allows a debtor to file bankruptcy again. However, the law also bars the discharge of any debts that were subject to a Chapter 7 petition within the last eight years or with a Chapter 13 petition within the last six years. Most people who file for Chapter 7 bankruptcy are able to discharge the vast majority of their debts almost automatically. To prevent discharges from being granted for debts that are legally not subject to discharge or to debtors who don’t deserve them, creditors and other parties in interest have a period of time to file objections. Once an objection is filed, the matter must go before the bankruptcy court for a final decision before a discharge order will be entered.